MoMo 2.0: Denmark for Dummies! On Saturday afternoon I had the privilege of being one of the 2 guest speakers at the first ever "Denmark for Dummies". This was a joint project sponsored by the Herning Chamber of Commerce, Nordvestjysk Chamber of Commerce, and five of the libraries in our areas as a part of a special initiative this year to promote multicultural attitudes in all five communities (Herning, Ikast-Brande, Ringkøbing-Skjern, Holstebro, and Struer). 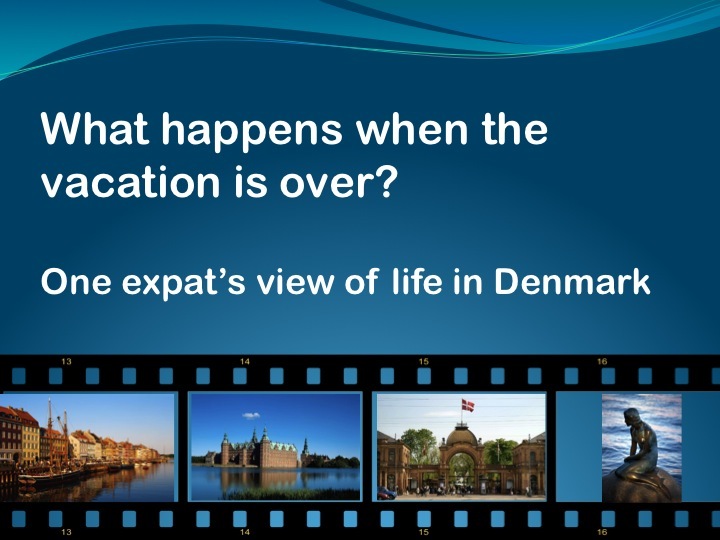 Well, since our motivation was to "get better in our knowledge about DK and the Danes", the title seemed perfect! Like I said, I was one of two speakers....the other being Dennis Nørmark, a "famous-ish" Danish ethnographer who has done a great deal of professional research in the area of the relationship between Danes and foreigners. (oh and I did I mention he is on Wikipedia?!) Yeah, Dennis Nørmark and ME! because my goal was to share with people (specifically foreigners living in DK) strategies that they could use as they strive to make Denmark their home. Besides the presentations from Dennis (the famous Wikipedia entry) and myself, we also had an activity called "Borrow a Dane" (sort of like when you "borrow a library book")... the idea was that you could go up to several Danes (who were part of a panel) and ask them any questions you had about Danes or Denmark. It was awesome to watch! 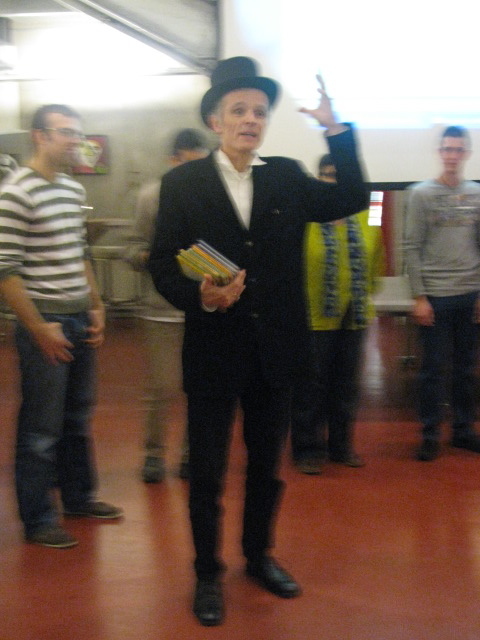 The presentations and "learning" part of the night ended with a visit from Hans Christian Andersen just before dinner! After he said a few words to all of us, a Danish dinner buffet was rolled out with EVERY SINGLE DANISH FOOD you can imagine! The idea was to allow the foreigners to try it all! From frikadeller to flæskesteg to smørrebrød to tarteletter! Plus of course for dessert we had rød grød med fløde.....so we could taste that AWFUL PHRASE the Danes try to get us to pronounce! No one left that night hungry! .... and I completely agree with them! Kelli, I am reminded of one of the many framed pictures that adorn our walls at work. Don't remember the photo but the words are "Never doubt that a small group of committed individuals can change the world" I think that most of the time, "world" means "where we are planted". Pleased you had a great time and people built alot of bridges. There is one culture that I do not feel comfortable with, but the fact of the matter is that I have never gotten to know one person from that culture that I did not feel comfortable with 1 on 1. Strange. Sounds like a wonderful event. Let's hope that more kommuns in Denmark start doing the same thing - just imagine all the positive feelings that would generate! You said that it was part of an initiative to promote multicultural attitudes. Yet the day you describe is all about Danish culture. So effectively, it was about integrating into Denmark. You may not be familiar with the tenets of multiculturalism, but the foundation of this idea is the acceptance and/or promotion of multiple ethnic cultures within a community/society/workplace/country, etc... That acceptance INCLUDES OUR (the expats') acceptance of the Danish culture and traditions. However before you can ACCEPT THEM, you must know what the heck they are. As I stated in the FIRST paragraph of this post, this event is part of a year-long initiative by the 5 libraries and 2 Chambers of Commerce. This is just ONE PIECE of it. I am familiar with the tenets of multiculturalism. So is the idea that next time you look at another culture, such as American, British or Indian? Or will the Danish themes continue? If so, then you're not promoting multiculturalism at all. You're promoting the idea the multiple cultures can join the Danish cultural model. Can you really not see the difference between the two concepts? I was merely a guest speaker at this SINGLE Event. I am not part of the planning committee, nor do I work at the libraries or Chambers of commerce, so I cannot speak about their full year's program. However, I do know several of the folks involved with this initiative and they are very multiculturally focused,so I feel quite confident that their year's program will include more than just the Danish culture. This was an amazing outreach that these groups made to the international community.... and every expat there felt welcomed.... and were enormously appreciative for this opportunity to learn a bit more about Danish culture. You're perfectly entitled to be impressed by this event. And you might be correct that at some point the focus might shift towards celebrating multiculturalism. But from your description, and with you now admitting that you're not sure about whether this shift will take place, all you're describing is more of the same thing that immigrants are exposed to when dealing with the various aspects of becoming a part of this country. It's an integration exercise. You talk about HC Andersen appearing, 'Loan a Dane, 'Denmark for Dummies', Danish food, Danish songs, Danish dancing, etc. I don't mean this as a criticism of the event or you. I just fail to understand why the kommunes would think this is promoting multiculturalism. It seems to be following the Danish model, which believes it is better that different cultures follow a single cultural model. A multi-cultural celebration would give weight to all cultures. None would be central or seen as better or in need to be followed. So it might have Indian food, a Czech author, Irish country dancing, African folk music, a 'loan an Aussie' programme, and so on. I agree 100% with what you said and my hope is that now that the foreigners have opened themselves up to learning about DK, that DK (well, at least our community!) will open itself up to learning about us. Again, I cannot speak for the organizers of the initiative, but I can place my hope in them because I do believe their hearts and their intentions are in the right place. I read about this event: http://www.dr.dk/Regioner/Vest/Nyheder/Herning/2010/10/30/073800.htm It's being marketed at an attempt to hang onto "good" foreigners, those with specialized jobs who bring talent and tax dollars into Denmark, as opposed to those who slip through the system when they arrive through familiesammenføring and have difficulty learning a new language as an adult and finding rewarding work. For this reason, I don't see the efforts of the region as being done with "their hearts... in the right place". The latter group and their families could benefit from any extra effort, and I don't believe this is being done here. I think as foreigners in Denmark, who have been exposed to so little willingness on Denmark's part to welcome residents from other countries and help us thrive here, a small gesture like this is perhaps something we should get excited about. However, this "one piece", while being a change from the complete lack of initiative we usually see, seems minimal, and actually targets a different group of people than I think you thought it involved, while others may have heard about it and slipped in. "Denmark for Dummies" is just a thoughtless title, but apathy is rampant here. While the "Dummies" franchise is meant as a basic, step 1-type of instruction, the books are found in bookstores alongside many other similar books, offering a choice of whether or not you're comfortable referring to yourself as a "Dummy". Offering one method to "help" foreigners find their way in Denmark, however open they may or may not be to the experience, and calling it "for Dummies" is patronizing, and without choice. I admire you for doing your best to carve out a life for yourself here. Denmark happens to be a place that's changed greatly over the last 15 years (in my experience, anyway), and the rampant and continual xenophobia towards foreigners by Danes is something the rest of us are standing up and fighting against - we may speak Danish and work here and function within the society for years, but we won't be content until there are opportunities and understanding for all of us, new "ghettos" included. I feel that involvement in projects that aren't truly targeted towards all of us are just putting another drop in the sea of apathy, but you have to make decisions that work for yourself, in the area where you live. An effort by Danes to learn more about the cultures that now reside within their borders would be astounding. More Danes standing up against the current integration laws that are currently being put into place, making it nearly impossible for foreigners to survive here within the strict parameters of day-to-day existence that have been put into place to avoid a pervasive Muslim demographic in Denmark, would be earth-shattering. “Dummies” – perhaps a quick brainstorm could come up with something better. "About Denmark", "Taste Denmark", "Denmark Presented to You by Danes"... anyone of those sound much more inviting, and I think would be seen as more of an effort to welcome than anything else. Denmark still hasn't learnt that it's integration NOT assimilation. I just wish they could be the 'bigger person' and not so pig headed to have the *we need to learn from our own mistakes* excuse. Or better yet *Denmark is a small country not used to immigration*. If the EU and UN are telling you that something is wrong, shouldn't that be making some alarm bells ring? I'm a 22 year old Caucasian Australian (Irish, Welsh, Scottish & English background if you're wondering!) married to a 25 year old Dane of Danish parents of Danish parents of Danish parents..., who has been exiled to the UK for the time being because of the 24-year rule. Nobody chooses where or when they will be born, or what nationality or ethnic background their parents are. Yet this is too often the source of shame in Denmark. And what makes anybody's culture less valid than another? Just as Danes are proud of Denmark and want to share it, so are others proud of their countries and backgrounds too. It can be intimidating to be in a new country where people are force feeding you their culture and you feel as though your own is suppressed. You want to tell others about your own culture too, don't you? Once you have chosen to live in another country, you have chosen to learn about that country, it's people, it's culture. But you still have your own personal identity too. For me, I was born and raised in Australia and will hold my own Australia Day festivities, I will cook Australian foods, but how does that make me any less able to be 'Danish' and appreciate Danish culture? I'm a vegetarian with a yeast intolerance so I don't and can't have most Danish foods. Because I can't drink beer and wont eat flæskesteg I will not ever be able to be Danish? Kelli, I'm not picking on you whatsoever. I totally understand your point and feel warmed that as a 'foreigner' in Denmark you can still have some faith in it. I too think it's in a lot of ways baby steps to get towards the final goal. Those of us who have been delivered disgusting discrimination, be that ageism, racism... at the hands of the Danish government and/or society will feel a lot different to you. I have a complete love/hate relationship with Denmark, and my husband is disgusted that I was treated this way by his country, and also how his country could deny him the right to live with his wife. What kind of feelings of Danish pride does treatment like this give to those wishing to be a part of Danish society and those Danes who are family and friends to these people? And in the end that's only bad news for Denmark. MARY - You have to think what kind of 'educated' and 'talented' person is stupid enough to want to live and work in Denmark anyway? All I ever feel is that it's too bad I'm not a millionaire rocket scientist with a penchant for bimboes who appear on Paradise Hotel.